Clay paving has been used in landscape design for centuries, and continue to offer the most durable material in projects small or large, domestic and commercial, throughout the country. The wide choice of colours and finishes allow for modern and traditional design, bold, conservative, or traditional, for all possible situations. 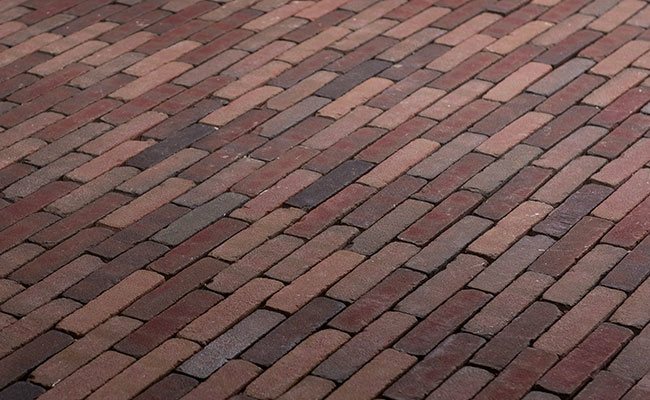 Clay pavers for landscaping, used either ‘dry lay’ method on sand or ‘wet lay’ into mortar bed offer many design options in the use of the products and require little or no maintenance. Example 1 here shows what really is the classic English garden in a red brick paver look. This is Old English, stretcher bond pattern, used flat rather than on edge, either way can be very effective with this product. Example 2 shows Chestnut. This is an on edge product, gentle colour tones, which helps give the right overall effect in the approach to the property. Very effective in producing a quiet balance in this landscape project. Example 3 is clean, crisp, modern without losing the charm of clay pavers. This is Delta Blue. Blue and Black are very popular, in all our ranges, as the colour can make planting, lawns, and foliage vivid looking against this contrasting effect. Example 4 is Chesham Multi. This ranges from orange to very deep reds, with some browns and aged pieces in the mix. This is a good option when lighter and bright red colours are needed. This compliments natural stone greys by adding colour to the scheme. Example 5 is London Mixture. This is a gentle aged yellow, and works well in many situations of landscape design, domestic and commercial. Example 6 is Cadiz Nostalgie. This gives a good range of colours, as do all in the Nostalgie range, but keeps the right balance of warmth and depth without becoming overpowering. These are just a small sample of ideas to show the scope of options Chelmer Valley can provide you with for landscape paving products. All our products can be seen at our Hutton offices in our showroom, and help is on hand to provide guidance and advice. In addition to these facilities, to help you select the landscaping pavers that work for your scheme, we now have a paver search tool on our website. This facility allows you to search by colour, range or name.